What if one disease is particularly nasty? Or, if a fifth disease is wreaking havoc? Or, even worse, if that fifth disease is being spread by a hidden Bio-Terrorist? 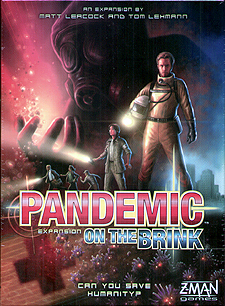 Pandemic: On the Brink is an expansion to Pandemic. You need the base game to play the expansion. Pandemic on the brink is a collection of add-ons for the basic pandemic game. The really good thing is that each add-on can be added individually or in conjunction with each other. A really good new element is: Rules to allow five players to fight the pandemic. A number of New role cards which bring different strategies to the game; There are some New event cards which definitely add variety to the game and the expansion changes the rules so that there are two randomly chosen event cards for each player. This again gives more variety and more chance a player will get an event card. For me the best bit is that they have added in a new epidemic card so instead of playing with 6 cards I can now throw in a 7th for legendary difficulty. The other major change is the addition of the Virulent disease epidemic cards. The new virulent epidemic cards work the same as the original cards but when the first is drawn whichever disease has the most cubes in play becomes virulent and each card has an effect on it that changes the way the virulent strain behaves. If you needed anything further to make this hard add a 5th disease(purple)can now break out anywhere in the world. So in order to win you must cure the 4 base diseases and remove all purple cubes or hand in 5 cards of any colour, but one must be for a city that has a purple cube on it. Of all the additions this expansion offers there is one that I definitely won't be playing and that is the Bio-terrorist. In essence one player works as a hidden terrorist tracking his / her movements on a pad. The players must hunt him / her down, its a personal choice and whilst I won't play with this element I could understand why some people would enjoy a traitor aspect. If you have the base game and you love Pandemic then this is definitely an expansion you should consider. Pandemic on the brink is a collection of add-ons for the basic pandemic game. Each add-on can be added individually or in conjunction with each other. The new elements are: Rules to allow five players to fight the pandemic. New role cards. The new roles bring new strategies to the game; from the humble generalist (5 actions a turn) to the field operative (uses disease counters in the place of cards when curing a disease). New event cards. The new event cards add variety to the game and the expansion changes the rules so that there are two randomly chosen event cards for each player. This again gives more variety and more chance a player will get an event card. A new epidemic card. 6 cards not challenging you anymore, throw in a 7th for legendary difficulty. Virulent disease epidemic cards. These new epidemic cards work like the original cards but when the first is drawn whichever disease has the most cubes in play becomes virulent and each card has an effect on it that changes the way the virulent strain behaves; from each outbreak counting as two outbreaks, to two counters being placed instead of one when an infection card is drawn. These cards can force you to concentrate on keeping the virulent strain under control. There are 8 of these, and you randomly choose the ones that are included in the player deck, and this guarantees you never exactly know how the virulent strain will react. A 5th disease. A mutant strain (purple) can now break out anywhere in the world. To win you must cure the 4 base diseases and remove all purple cubes or hand in 5 cards of any colour, but one must be for a city that has a purple cube on it. Bio-terrorist. Of all the elements this is the one that appeals least to me and I haven't played it. In essence one player works as a hidden terrorist tracking his movements on a pad. The players must hunt him down. If you are fan of pandemic them this is an essential purchase, it takes the base-game and makes it much less predictable, and much more challenging. I don't care for the bio-terrorist as I never felt the game neede a 'traitor' element, but this doesn't detract from the value of this product. The box also contains 'Petrie' dishes for storage and has been designed to store the components from the exapansion, the base set, and I suspect the in-the-lab expansion too.